Welcome to Talbot Racing's website. We were a Drag Racing team based in Cheshire in the United Kingdom. We were involved in for over 19 years in the UK National Championship in the fastest of all sportsman classes - Super Pro ET which allows cars to run as fast as 6.00 seconds over the 1/4 mile. 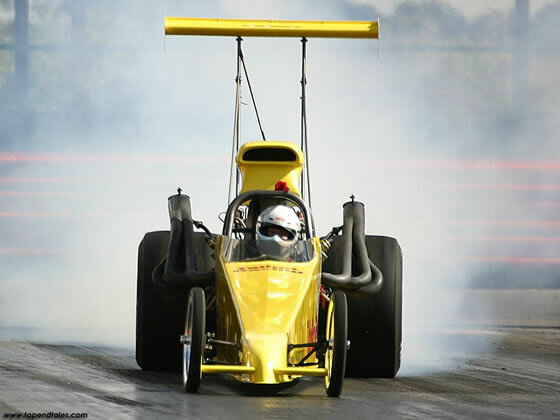 Our lady driver - Pat Talbot, raced the 27ft long, 1800 horsepower, dragster as her hobby - it made a change from her day job of University Lecturer in Nurse Education! Top Speed - fastest E.T. During our career we ran a whole seies of 6.90 second runs over the quarter mile. That's 0-60 in less than 1 second. Our motto was alwys go out, go fast, have fun, and WIN. Please feel free to look around our website. We hope you will enjoy it. Especially the awsome photography courtesy of Sharkman - Tom Ward. Super Pro ET 340 . The Team retired late in 2013.We sold the car to a great guy Liam - who still races it at Santa Pod in the UK.